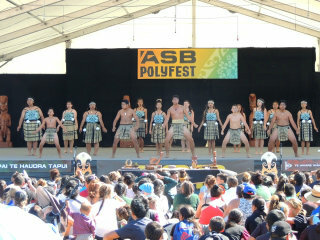 Our Kapahaka group performed impressively on the Maori stage at the Secondary Schools' ASB Polyfest last week. Mrs Jennifer Leauga and her team have worked extremely well with the students to reach their current high standards. Congratulations to everyone concerned! Lynfield College competed in Division 3.. our performance was good enough for promotion to Division 2 next year. 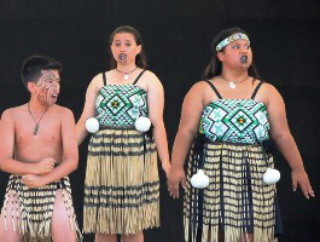 During Easter weekend Maori Television will screen Polyfest performances from every school -Friday through to Monday at 4.30pm on Channel Sky 82, Freeview 15. 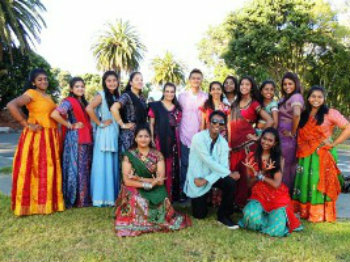 Our Indian group created a colourful performance for the ASB Polyfest and were very well-received on the Diversity stage. 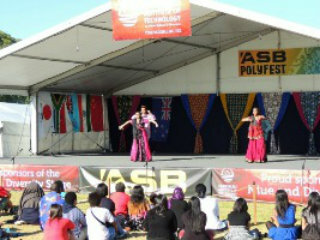 The Samoan student group fundraised and practised to ensure a polished performance at Polyfest. They didn't disappoint on the day as these images show. After many hours of practice our Indian girls entranced with a beautifully graceful and colourful performance at Polyfest. 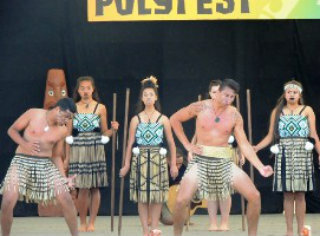 Our kapahaka group was an early crowd favourite when they performed at Polyfest on March 18. 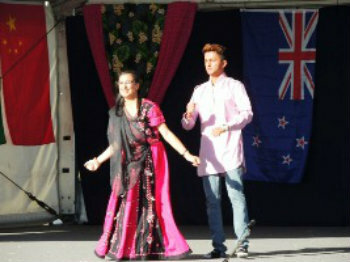 The image on the right was in the NZ Herald and is of Deputy Head Girl Sarai McKay performing on stage with the group. There are just so many great images of our students at Polyfest a collage was easily assembled! Last week's ASB Polyfest was a very special occasion as our Indian group performed on the Diversity Stage, and our Kapahaka group was awarded first prize in the co-educational schools' Mau Rakau category. This year’s theme for Polyfest was ‘Care for our seas and our lands, so that the safety of our homes both present and past endure forever’. The five and a half minute performance by the Indian group was choreographed around songs that reflected the preservation and significance of water and land. An early morning performance was made even earlier with a last minute time change, putting extra pressure on the 13 senior students and a single Year 9. But these experienced performers took the stage with confidence and danced their hearts out to a fusion of Bollywood favourites. They all had great fun rehearsing, performing and enjoying a full day at Polyfest. Congratulations to everyone (students, staff and whanau) who worked so hard to ensure Lynfield College was so well represented at this event. Lynfield College Kapahaka group performed at not only the concert but in Competition round with other secondary schools at the ASB POLYFEST and placed 3rd in Mau rakau!!! Head of Te Reo Maori Department Jennifer Leauga comments "I am amazed at what was accomplished in 3 weeks but also so proud and ecstatic that this has built a strong platform upon which the students can build. Our leaders Eli Kaleta and Olivia Riggs were outstanding and I am so grateful to everyone who helped. Support has been the key element to our group, from Mr Bovaird, tutors, and staff. Whanau also played a major role in allowing their children to participate and get to rehearsals; believe me we can only get better. Set high expectations and they will get there!" On Friday morning the Lynfield College Kapa Haka group returned to the ASB Polyfest venue to support the speakers at an official ASB Polyfest media and sponsors presentation. The guest speaker was Beatrice Faumuina – a former Lynfield College student. It was only fitting that this group of students should perform a Waiata at the end of her speech. They then went on to support all the speakers, including the Lynfield College principal who is the chairman of the Polyfest Trust. The skill and superb presentation of the Lynfield group impressed all those attending. This was a fitting recognition of the outstanding effort put in by these students over the past month.